Activision has revealed some of the stages and songs available in Guitar Hero: Aerosmith. Weeks away from its June 29 release, Activision is just now opening Guitar Hero: Aerosmith to previewers to perfect their Joe Perry impersonations. 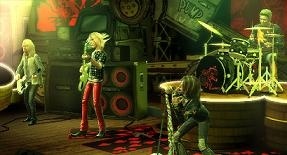 Despite being derivative of the Guitar Hero formula, the band took the effort to perform motion-capture and record video vignettes that will be played during the game's career mode so as to freshen players' fret-fests. Band members Joe Perry, Brad Whitford and Tom Hamilton add to the character roster, while singer Steven Tyler, drummer Joey Kramer and rappers Run DMC all make cameo appearances. Divided into five locations, 25 of the final 41 tracks have been shown thus far. Owners of the Xbox 360 or PlayStation 3 editions will not be able to play downloaded Guitar Hero III songs from the Aerosmith disc. Aerosmith - "Draw the Line"
Joan Jett - "I Hate Myself for Loving You"
The Clash - "Complete Control"
Aerosmith - "Livin' on the Edge"
Lenny Kravitz - "Always on the Run"
Run DMC - "King of Rock"
Aerosmith - "Bright Light Fright"
Run DMC featuring Aerosmith - "Walk This Way"
Owners of the Xbox 360 or PlayStation 3 editions will not be able to play downloaded Guitar Hero III songs from the Aerosmith disc. There are more songs as well. According to a leaked achievement list, Train Kept A-Rollin' is in as well. This looks like a fantastic rental. I don't love Aerosmith near enough to actually buy this one. I'm waiting for the Metallica game.